Hi - nice post, thanks for sharing this. I've been using Lectora and Captivate in tandem for a number of years as I've viewed them as complimentary products. Looks like at last Adobe is offering a product that can cover both types of content. Presumably you can capture quiz answers and feed back coaching comments/answers to the learner as well? What do you think - is this the killer app we've all been looking for in the wake of the Flash/HTML5 developments? Nice article Jonathan, easy to follow and understand. Perhaps you should have added that an advanced action doesn't release the play head, contrary to a normal action (by using the Action accordion). This is an important difference. 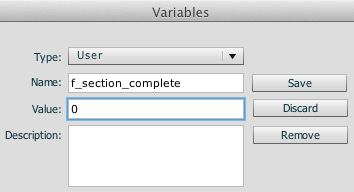 At least if you trigger this advanced action by an event caused by an interactive object (Button, click box, TEB) and also by slide events in versions up to 5.5. 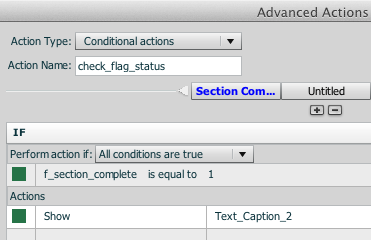 However: the On Slide event that you are using will not stop the playhead in Captivate 6! Just a warning. Will blog about it soon.